Reason Magazine is the nation's leading libertarian commentary magazine designed for people interested in economic, political, social, and international issues. Every month, Reasonmagazine offers readers a refreshing alternative to the conventional liberal and conservative fare, with provocative commentary and cutting edge analysis of politics and culture. 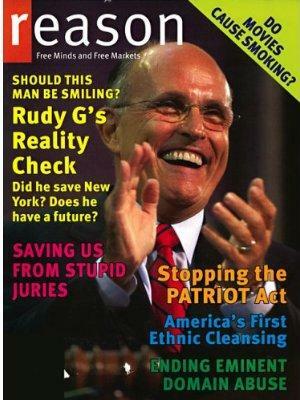 Reason Magazine is the only commentary magazine praised by both the ACLU and Rush Limbaugh. Reason magazine brings you a refreshing alternative to right-wing and left-wing opinion magazines by making a principled case for liberty and individual choice in all areas of our lives. You'll also find articles in Reason magazine on local and state issues with national impact and science and technology. Reason magazine is not liberal or conservative but rather looks at daily news and events from an unconventional viewpoint. Reason magazine is interesting and provacative. If you are bored with the old left or right points of view, Reason Magazine is for you. Reason magazine is published by the Reason Foundation, which has led the fight for freedom in America for over 20 years.